Currently, the only way for Sandra to get this information is to write complex SQL queries using an internal tool. This method works, but is difficult to learn, prone to user error, and not fast enough to get the answers and presentation quality she needs. At first glance, this is a rather complex problem I was tasked with solving. Providing a lot of very unique, specific data sets involving stakeholders I have very little understanding about. To start, I decided to breakdown the problem as much as possible. For the end user, it's a pretty straightforward data entry and display problem. The user sets a few parameters, and the tool spits out the data he/she was looking for. Beyond the user, the other key stakeholder for this tool is the event organizer or venue owner. They are the ultimate decision maker that the data being retrieved is trying to appealing to. I tried to dig deeper into what makes them tick, how they make their decisions in terms of partnerships. With the limited research capabilities at hand, I was able to identify some stadiums that have already developed partnerships with Uber, as well as key quotes from stakeholders on the stadium side. Their biggest challenge is bringing people into the stadium VS people staying at home consuming content via TV. And they want to remove as many friction as possible along the way of bringing people out from their homes, into the venue. Commuting and parking become obvious problems. After getting a good sense of all the stakeholders' goals and incentives through the research available at hand, I set out to define some things I wanted to achieve with my design. 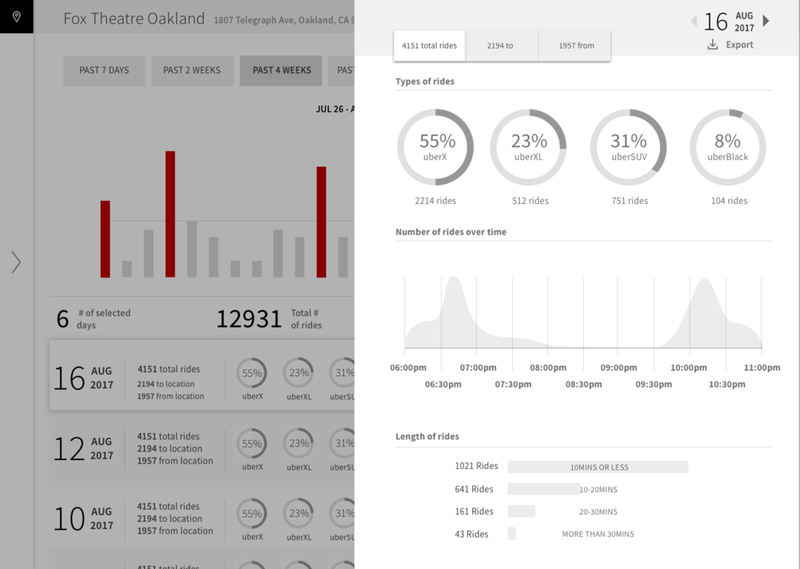 Ease of data entry: instead of having the user enter things like location, date, and time, and fine tuning it, is there an easier, more informed way for some of these to be preset? Ability to compare the data: While data points for one particular day is good, I wanted to explore value in comparing these data over a period of time, dates, and potentially locations. With the stakeholders laid out, and design goals defined, I set out to explore different ideas. Usually, my design process is consisted of explorations on a defined scale based on initial research, and validating these ideas through additional research. This time, because the scope and available resources are different, I took an more iterative approach. I started out by figuring out the basics - what's the most basic, bare bone design solution that's need to get the job done? From there, I iterated on the idea as I went, constantly questioning and validating them based on my initial goals and research findings. 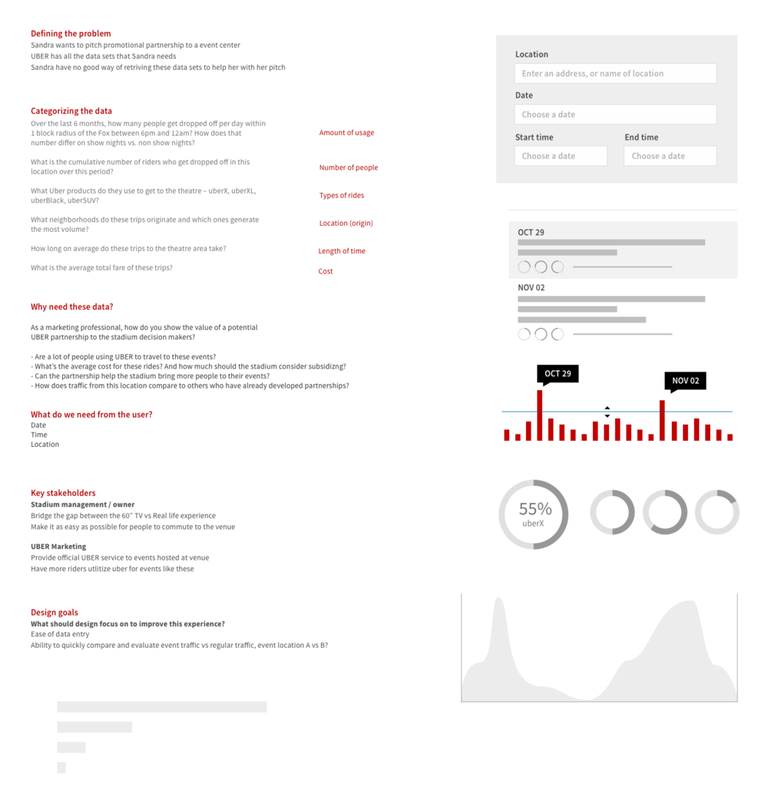 We explored a bunch of ideas around what kind of data should be displayed around one date, within a certain time frame. From there, I tried different ways of entering the data. Is the user going to be constantly changing these information? 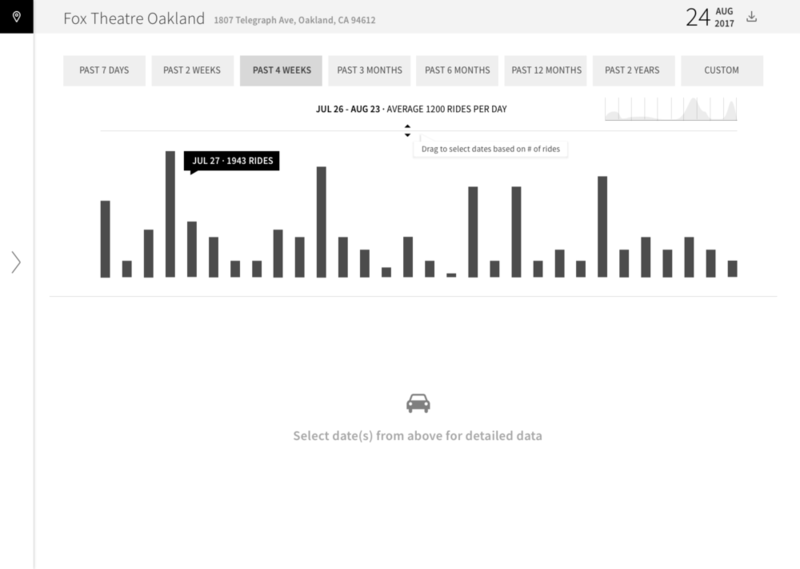 Or is it enter once, and dive deep into the data that's being shown? Would a collapse and expand work better than something that's always there, and always exposed? At this point, I really took a long hard look at the explorations I've done, and thought to myself, what do I want my presentation to have if I were Sandra presenting to LNE? Having worked with a lot of sales people in the past, and have built products that helped them with their pitch, I really tried to build empathy between me and user here based on my past knowledge. At the same time, I tried to imagine what would help the stadium owners / event managers to make this decision. What is the piece of data they are looking for to nudge them over the edge and partner up with Uber? Throughout this exercise, I really questioned the importance of showing the data from a single date. While it shows the details for a particular date, what the stadium stakeholders should be ultimately looking for is the consistency over time. How many times have such increase in Uber rides happened over the past weeks or months? Whats the differential between the increased vs regular times? How much is the average cost of these rides during times when it happened? I played around with a few ideas and tried prototyping them out. Ultimately, this is where we landed. The main bar uses the # of ride as a threshold. At end of the day, this a reliable indicator of a event that has occured. And by interacting with the bar, user can easily select dates of interest to dive deeper, which appears at the bottom in a list. Now that we have created an easy way for users to quickly select multiple dates and compare the data among them, I wondered how can we enable users to dive deeper into a specific dates. One of the most important things I've learned about enterprise tool in the past is that, its always important to allow your users to slice and dice the data in as many ways possible. First I tried having simple inline hover cards. While it's good to give additional information inline, the amount of detailed data that could be shown was extremely limited. 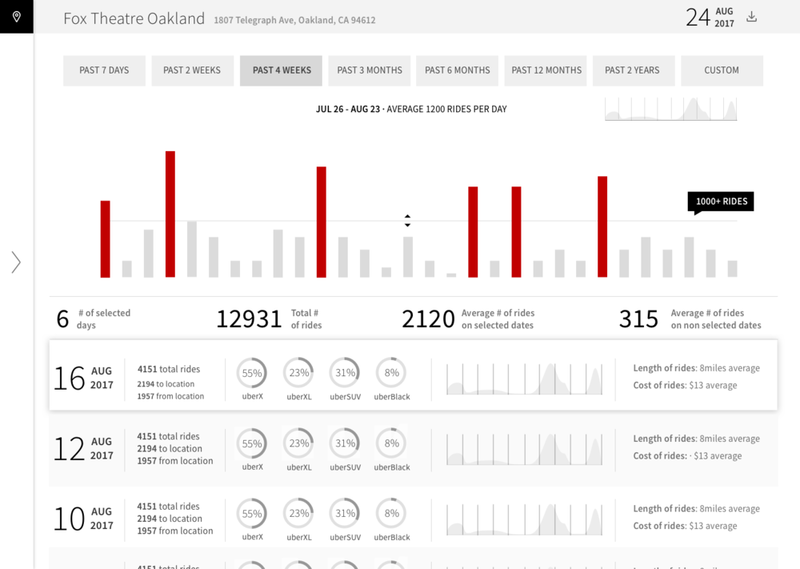 It almost felt like we weren't doing the rich data at hand justice, by only showing one hover card at once. If the user have expressed intent towards a particular date, can just give everything we've got on that date? A fly over is an interaction that I've tried and used in the past, it works exceptionally well when a user is presented with a list of different items, but want to dive deeper into each one. I thought this was the perfect application for this particular use case. When I first started this exercise, I really wanted to focus on the ease of data entry from the user. I believe this will not only makes the users live easier, but also informs and deliberately changes how people perceive and interact with the product. While working on this product, I became increasingly excited about potential opportunities this tool could bring for Uber. Besides different stadium like venues, can the same idea be applied to other points of interest? What about a local mall? A movie theatre? A casino? Or even popular restaurants? All of these destinations would be perfect for riders to have the chauffeur like experience that Uber can provide. Instead of research tool where you punch in information to find more data to support an existing pitch, it should be treated as a lead generation tool. Give it any location, and it can quickly display the user these key points of interest on the around the area, and allowing users to dig deeper as needed. From that idea, I quickly iterated the landing / home / front page experience to be tailed for a location based lead generation tool. Simplifying the overly complex multi entry home experience to a "give me a location and I will give you all the data for your pitch" kind of tool. I really hope this could inform users on how to better utilize the tool, to not only better craft existing pitches, but also identify new opportunities. Speaking of the pitch, one important part of this product is to not only display the data, but also allow the easy export of all the data to aid the user with their presentation. I see this similar to sharing features found on consumer products, where now that I've consumed the content, let me share it with others for social currency. Except in this case, the user is completing a crucial part of their workflow, and due to all the data points, the export tool needs to be extremely robust. Trying out a whole bunch of scenarios, and ultimately deciding that at the 3 month mark, days would turn into weeks for clearer display of the data. After exploring different ideas, working through detailed interactions and hammering out edge cases, I've landed with a solution that I'm quite happy with. I would love to take this concept and run it by some marketing folks to get their reaction and feedback. 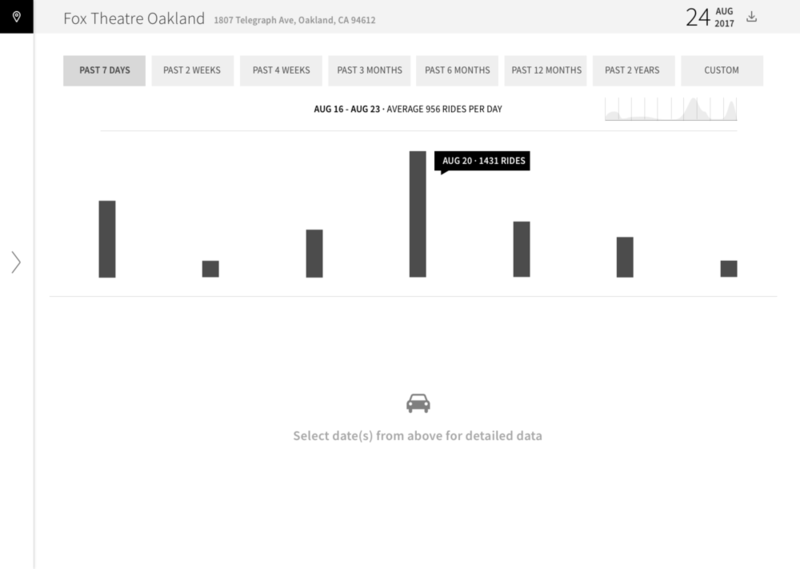 After validating the idea a bit more, I would iterate further on things such as the importance and hierarchy of different data points; the value of being able to quickly compare dates from any given range; and even comparing traffic at different venues. Data displayed for that specific time and date range. The product is designed to be used as a lead generation + data research tool. It's not limited to a specific location or time range, but instead scales with any points of interest, from sport venues to malls. The way information is entered, and data is surfaced allows users to quickly compare and get a broad overview of a specific location, while having the ability dive deeper into a any specific date. The export feature really allows users to quickly and easily export different data sets based on their needs and requirements.